So, you have finished your schooling and looking forward to getting admission in one of the universities that everyone is applying to. Or you are done with your graduation and thinking of getting a job. Uncomplicated choices easing your way into the future, isn’t it? But are you content with this? One life to live – are you going to live it like the rest of the herd? In today’s time, more often than not, students choose easier options in terms of their education; very few are goal-oriented or in the competitive spirit, which leaves a whole lot of bright minds untapped. The world is moving ahead and moving at a very fast pace. And it has become imperative to move out of one’s comfort zone and pick academic options that sets you apart. UCC Ireland Meritorious Scholarship for Indian Students 2018 is calling students to Cork – the second largest city in Ireland, known for its energetic and high-spirited vibe. Artistic and gifted people, an open economy and an amazing culture sets Cork apart from other places to study abroad for Indian students. Also, the fact that you will be a part of University College Cork, a university that ranks under the top 2% universities in the world with a wide gamut of highly ranked undergraduate and postgraduate courses, makes it even more worthwhile. The second largest exporter of computer and IT services across the globe, Ireland has a substantial presence of top global IT companies. Ireland’s technology sector has over a lac people with over 70% of them employed in various multinational companies. Since it has such amazing presence of IT companies, the place is always on a lookout for young and talented people. We at Buddy4Study have been helping more than 1 million students by connecting them with the right scholarships via India’s largest scholarship listing portal – for free. And it is of vital importance to us that we associate with the right partners to provide the right information to the students dependent on us for scholarship information. 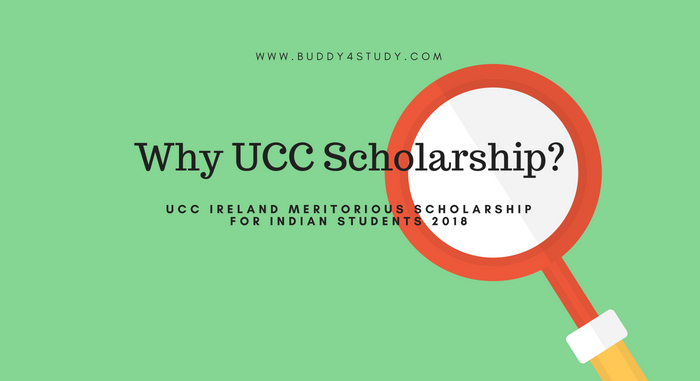 To implement UCC Ireland Meritorious Scholarship for Indian Students 2018, the university has partnered with Buddy4Study to handle their 1st step application system. Another important reason is that the application for the scholarship closes on 30 April 2018. So, commence your journey into a brighter future with UCC Ireland Meritorious Scholarship for Indian Students 2018 today! Click here to check out the step-by-step guide on how to apply for the scholarship.